The Surf 'n' Turf truck will soon start trial runs - without any hydrogen on board - travelling to and across the island of Eday. The first provisional date is Tuesday April 18th. 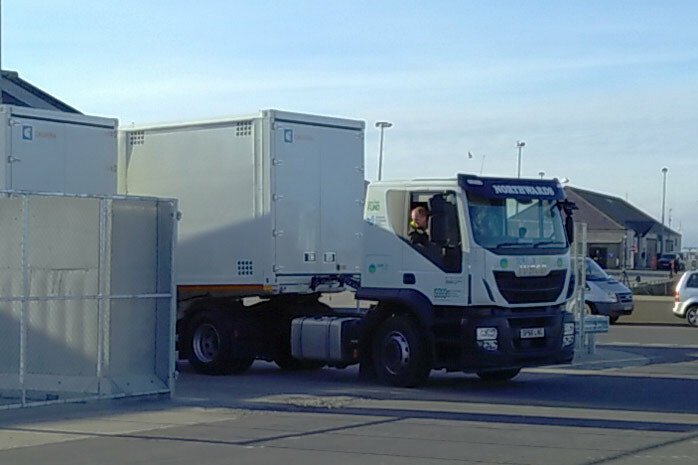 The white truck and its empty trailer will make the trip by ferry from Kirkwall to Eday and then cross the island to EMEC's base on the west side. The project team want to make final real-world checks before operations get going. These are test runs, so we can work out how to minimise inconvenience to ferry users and Eday residents. The trailer won't be carrying any hydrogen. Further test runs are planned that will concentrate on safety, and involve the local fire fighters as well as the Orkney Ferries crews.